Prepare to catch jungle fever this half term as ANIMAL KINGDOM: LET’S GO APE brings breathtaking, imaginative animation to cinemas across the country from October 23, 2015, courtesy of Signature Entertainment. It’s not long before Edward discovers fire (well, someone had to! ), hunting, modern living, love and even... hope. As generous as he is advanced, Edward wants to share everything, revolutionise the established order and bring his people bang up to date – with hilarious results as the rest of the primates try to get to grips with a new way of doing things! 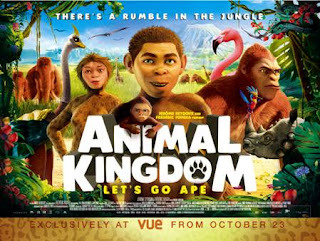 So be prepared for a rumble in the jungle this half term as the primates begin to realise that evolution isn’t complete monkey business after all!